Albert Faille was a quiet man, a trapper and prospector in Canada’s vast, unexplored north, but by the end of his life he had achieved relative fame as one of the most steadfast explorers of the South Nahanni River region in the Northwest Territories. Albert lived in Duluth for only a short time, but according to his stepson Harry, he always claimed Duluth as his home. Albert’s early life is something of a mystery. He was born around 1887; he may have immigrated to the U.S. with his family, or he may have been born in Pennsylvania or Massachusetts. At various times he lists his parents’ nativity as Swiss, Norwegian, and Bohemian. In a brief memoir, he says he was separated from his family when he was very young and lived with a farm family in New Salem, Pennsylvania. At a young age, Albert said, he ran away from that family and took to the road, riding the rails and finding odd jobs to support himself. He ended up in northern Minnesota, taken in, as he said, by a hobo living in a shack outside of Tower. This man taught him how to survive in the wilderness, skills he utilized all his life. Albert entered World War I around 1917, which would have put him in his late-twenties. The U.S. Army assigned him to the 10th Forestry Engineers, a regiment of men experienced in logging and sawmill work who were sent to France to supply the Allied forces with needed lumber. After the war, Albert returned to Minnesota and worked for the St. Croix Lumber Mill in Winton. He also continued trapping in the winter, and would bring his furs to Duluth to sell. Around 1920, Albert returned to Winton from a trip to Duluth with a wife, Marion Carlson, and her son Harry. After the Winton mill had closed, Albert, Marion, and Harry moved to Duluth in the spring of 1924. They first appear in a Duluth city directory in 1925, living at 4029 London Road. Albert lived in Duluth for several years but spent much of his time trapping in northern Minnesota and Canada, returning periodically to Duluth to sell his furs at the Hudson Bay Fur Company, then at 15 West Superior Street. In July of 1924, for example, he crossed the border at Fort Frances, traveling from Duluth to Edmonton, Alberta, on the Soo Line Railroad. Although Albert was often away from home, he supported his family in Duluth with money from selling furs, mostly mink. It’s difficult to say when Albert moved to Canada permanently. He said he asked Marion to go there with him but she wasn’t willing to give up city life, and she and Harry lived the rest of their lives in Duluth. It might have been in 1927, when he wintered on the Flat River in the Northwest Territories. The Flat River flows into the South Nahanni River about 150 miles west of where the Nahanni empties into the Liard River, near the settlement of Nahanni Butte. It was in July of that year that he encountered R. M. Patterson canoeing up the Nahanni River and the two traveled together for several weeks. Patterson documented this trip in his 1954 book about the Nahanni, Dangerous River. Albert traveled to the Flat River both to trap and to search for a legendary lost gold mine. As the story goes, in 1906 the McLeod brothers died in Deadmen’s Valley (later called Headless Valley) while searching for gold. Their skeletons, missing their skulls, were found in 1908 with a message in their camp reading, “We have found a fine prospect.” Locals assumed the McLeods had been killed for their gold, and the legend grew. Albert headed for the valley on his first trip up the Nahanni in 1927, apparently hoping to find the lost gold mine of the McLeod brothers. 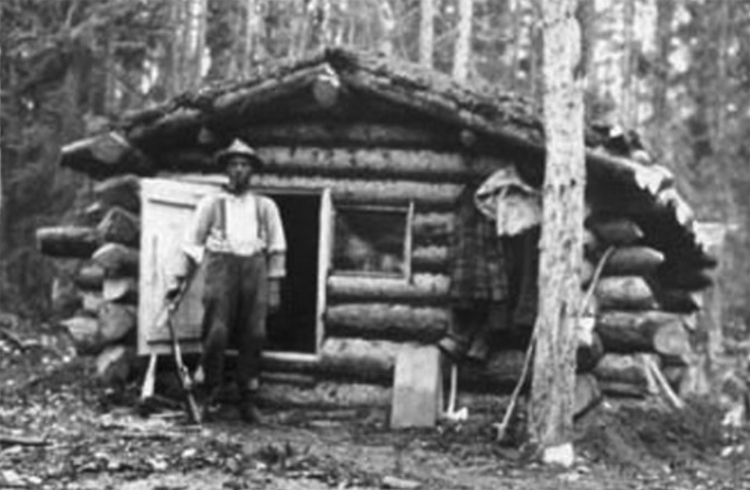 Sometime before 1930 Albert stopped returning to Duluth and spent the rest of his life in the Northwest Territories. He supported himself by trapping and guiding, and by finding some odd jobs—and spent his summers searching for gold. But people who knew him say he was there mainly because he loved the Nahanni country and wanted to be free to roam through it. Every season, after selling his furs and purchasing the needed supplies, he sent any remaining money to Marion in Duluth until her death in 1951. Living alone in the northern wilderness, Albert had many close calls but always managed to survive. He fell on the ice one winter near the Flat River, aggravating an old back injury, and was laid up for three weeks. He got sick with scurvy and went temporarily blind; he had to pull his own teeth when they became loose from the illness. When he was in his late sixties, his boat overturned on the Nahanni and he lost the craft and all his supplies. He spent eight days in the woods, attempting to walk 150 miles to Fort Simpson, before he was rescued. In 1957, when he was growing too old for winter trapping, Albert purchased a small cabin in Fort Simpson. But he still took his summer trips up the Nahanni searching for the lost gold mine. In 1961, the National Film Board of Canada made a film about his search. Nahanni shows Albert at about 73 years of age, motoring up the river in his freight canoe and portaging around Virginia Falls, a spectacular waterfall twice as high as Niagara Falls. Albert carried all his supplies—food, outboard, and gasoline—up the steep, one-mile path around the falls. He also hauled up lumber, piece by piece, to build another boat at the top. Albert never found the legendary McLeod mine, but the film won several awards and brought some media attention to Albert. Canadian Prime Minister Pierre Elliot Trudeau saw the film and in 1970 made a trip to see the South Nahanni and to meet Albert. Albert had lost contact with his stepson Harry after 1951, when Marion passed away. In 1965, the film Nahanni was shown in Duluth schools and when people told Harry about it he re-established contact with Albert. In 1968, Harry chartered a plane which flew him to Fort Simpson to visit his stepfather. Because he was Albert’s son, it was a big event for the town and a school holiday was declared. Albert died in Fort Simpson during the night of December 31, 1973. His cabin was purchased by the Commissioner of the Northwest Territories to be preserved as a historic site. The cabin is now kept as it was when Albert lived in it and is a popular tourist attraction. Canadian Prime Minister Trudeau established the Nahanni National Park Reserve in 1972.